ō-odori, or ‘dance of the fighting gudgel‘ from Satsuma. You probably heard of this martial art and its assumed influence on Ryukyuan bojutsu many many times. 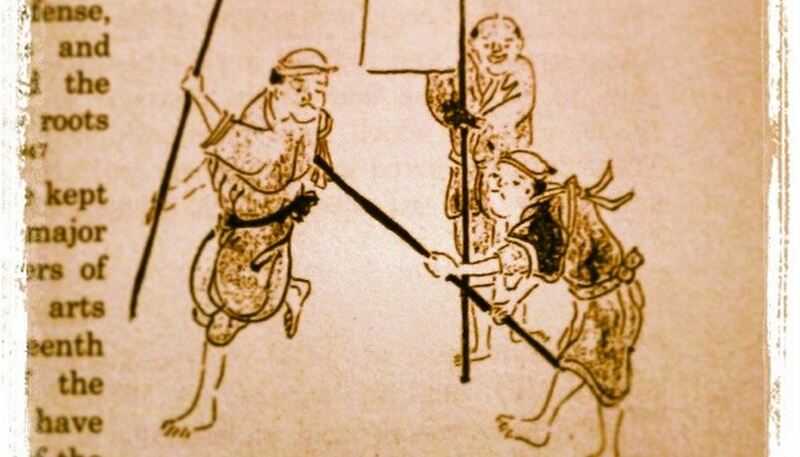 You probably read that the Jigen-ryū devised Satsuma bō-odori to be used as a covert line of defense. So far this illustration has NOT been covered in any book by karate kobudo masters. I put in in my Karate 1.0, though. Whether you’re 3rd kyu or 10th dan. Whether you’re on Okinawa or in Andalusia: this historical illustration here will be what is the first instance most of you catch sight of what it looked like. So take a second and look at it, and travel back in time. Imagine the sounds of the feet on the ground, the breaths and sounds of the performers, the quiet nature surrounding you and the dynamic tension filling the athmosphere while the strikes cut through the air. This entry was posted in Book Reviews and tagged bo-odori, Jigen-ryu, KARATE 1.0, satsuma. Bookmark the permalink.